8" x 25' R-4.2 Flex Duct (Yellow) - Holmes Plbg and Htg Supply Co.
ATCO #070, 076, and 078 are UL 181, Class 1 Air Ducts and are manufactured with a tri-directional fiberglass scrim reinforced, grey polyester outer jacket. The inner core of all three products is air-tight and designed for low-to-medium operating pressures in HVAC systems. 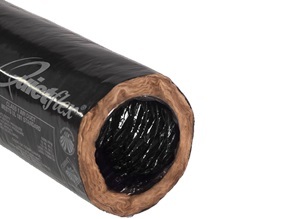 ATCO #076 and 078 have increased insulation for superior thermal performance.